This week marks the beginning of our area. Not for us, mind you, we homeschool. And as everyone knows from Phineas and Ferb, there are 104 days of summer vacation. My kids demanded 104 days of summer vacation and I was only too happy to oblige. I know that you have a lot to read at the beginning of the school year. Pages of rules, uniform stuff, schedules, fundraisers, PTA stuff, and things like that. So I’ll make this entry short. You. Are. Welcome. Here are two recipes that can be used for a Brainless Monday Meal (TM) or even as breakfast, served cold. Or….they can even go into a lunchbox! How’s that for multi-tasking! Don’t say I never think of you, because I do, all of the time. 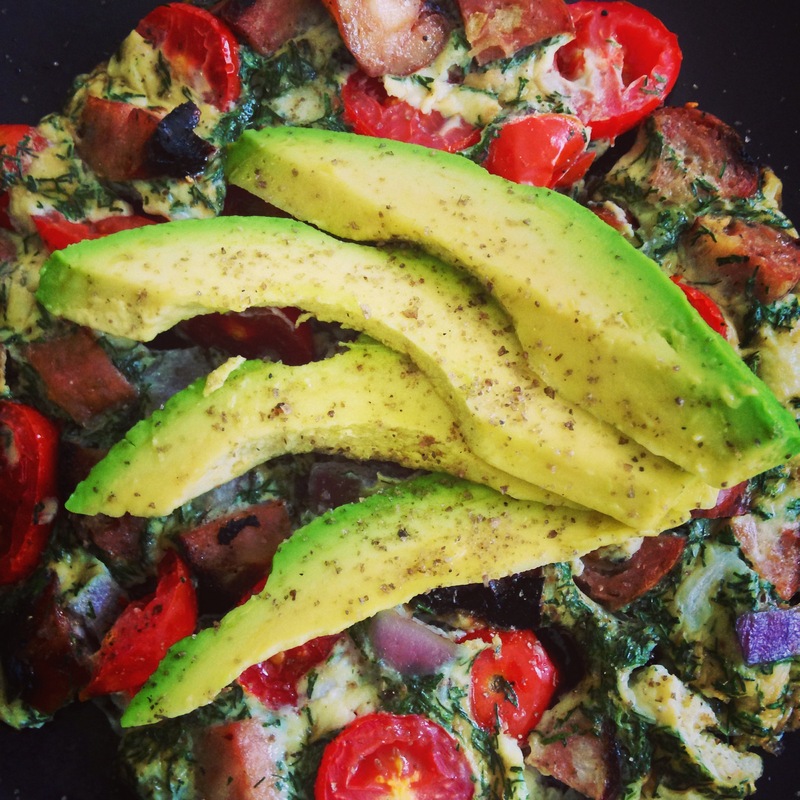 I want to make simple, healthy, gluten-free eating happen for you! And you can do something for me, you can make this! And you can eat well, on a Monday Night, that just so happens to be the first night after the first day of school. That totally made sense, right? Brinner? Does that make sense? Breakfast plus dinner. BAM! Brinner. *Make this a day ahead for the best results. 1. Cut the watermelon into bite-sized chunks. Cut and core the pineapple and cut it into bite-sized pieces. 2. Wash the basil leaves. Thinly slice 1/8″ pieces of basil. 3. 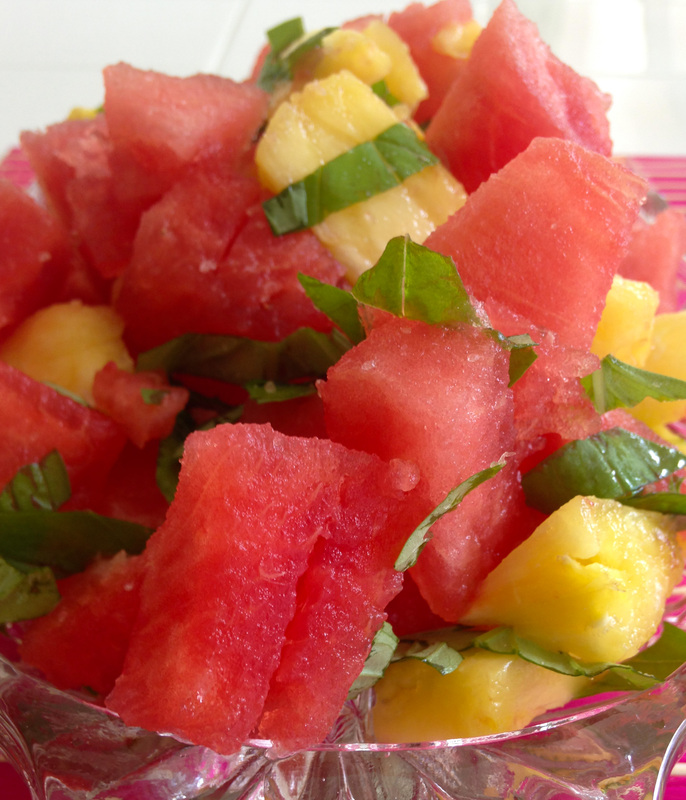 Place the fruit and basil into a bowl and toss gently. Chill. 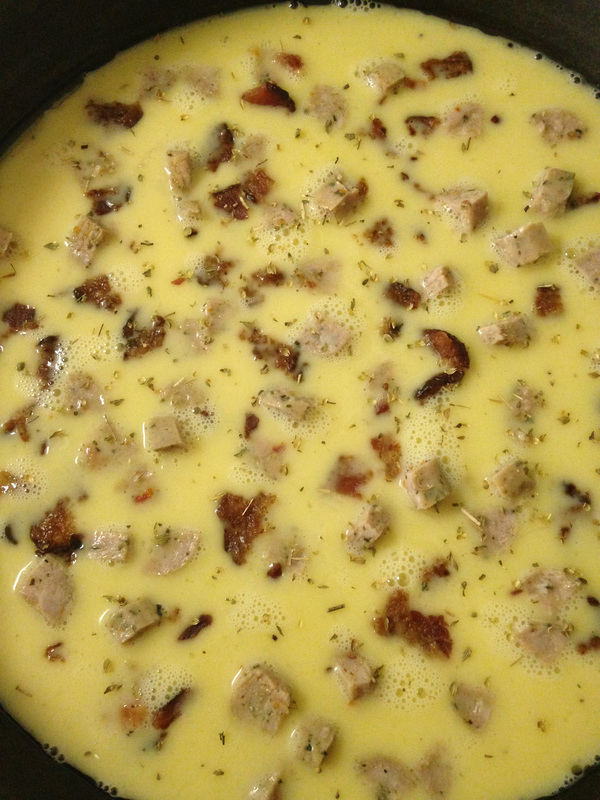 Allow the flavors to meld together for 8-24 hours. 4. Before serving, grind Sea Salt over the top of the salad. Serve! * Ready in less than 30 minutes, and totally reheatable. Any leftover cooked meat and vegetables that you have. 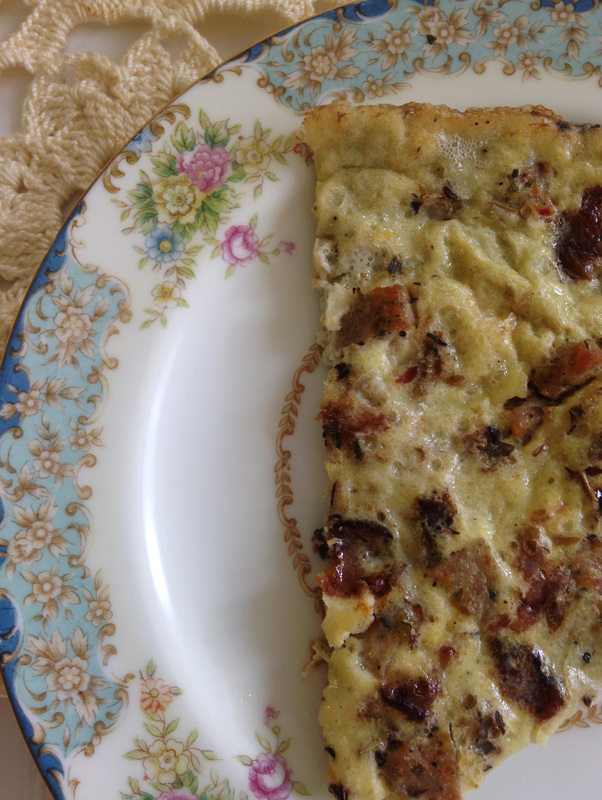 I have even used my Quick & Easy Chili recipe in frittatas before. Cherry/Roma tomatos, cooked potatos, sweet potatos, kale, spinach, just about anything will taste good! Frozen broccoli also works well in this dish. Dried herbs like basil, dill, oregano or even chili powder will all blend well depending on the type of meat/vegetables you use. Garnishes like: cheddar cheese, sour cream, avocado, guacamole, BBQ sauce, anything that seems to go together! *For a bonus-extra-super-scrumdiddleyumptious-tasty experience, use bacon grease to coat your baking dish/cast-iron pan. Really. 2. Crack and beat the eggs in a bowl, add milk and beat until thoroughly mixed. Just a regular whisk will do here, a hand blender will make the eggs too frothy. 3. Chop up any cooked meat you wish to add. Chop up any vegetables as well. 4. 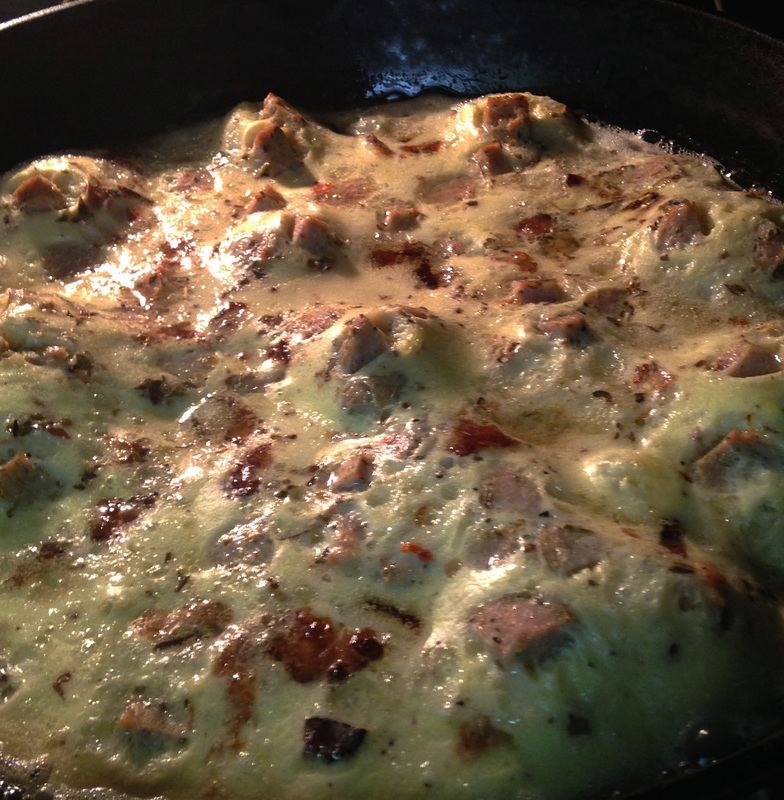 Grease you baking dish/cast-iron pan. 5. Pour egg and milk mixture in your pan. Add in your meat and vegetables. Sprinkle with your herbs. 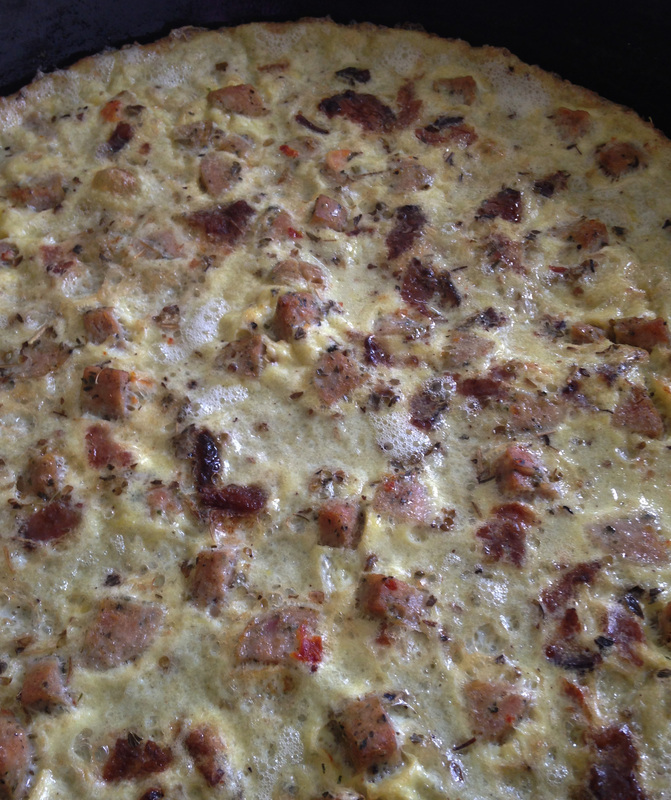 It will look like a giant mess, and you have to be ok with that….you have to break some eggs to make an omelet, or a frittata in this case, every cook will tell you that. 6. Bake in your preheated oven for approximately 20-25 minutes, or until the top looks “set”. Warning – this will puff up in the oven, like this, don’t sweat the puffy. 7. When done, remove the pan from the oven and allow to cool slightly before slicing and serving. Garnish with any topping you would like. This is also good cold, and excellent for breakfast! So that’s it – another Brainless Monday Meal (TM) in the pipeline! Easy, simple and quick!